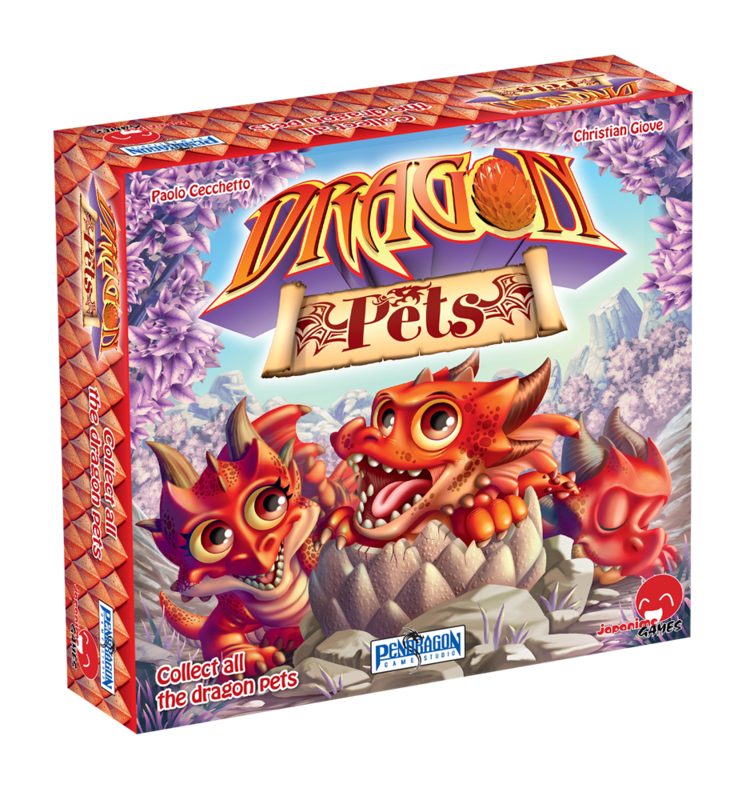 Dragon Pets is a game by Paolo Cecchetto and Christian Giove, published by Japanime Games. It is for 2-4 players. In this game, players take on the role of Dragon Breeders during the 1783rd annual dragon breeding competition. They will be sending their Dragon Seekers off in search of more dragons to be able to form mating pairs with. Each time they do this, they’ll earn gold coins. Of course they’ll have to be careful that they don’t wind up with any unbred dragons or they’ll lose gold coins. In the end, the player that can earn the most gold coins will be declared the winner and Supreme Dragon Breeder. To begin, the starting Dragon cards are separated from the rest of the deck. These cards are then shuffled together. Each player is then dealt 2 cards from them. If a player is dealt 2 dragons of the same color, then they must choose one to keep and one to return to the deck, drawing another. Any leftover starting cards are set aside. Each player will then choose a color and take the 3 Dragon Seeker meeples and the matching player reference card of their chosen color. They are also given 8 gold coins. The remaining coins are placed within reach of all players to form a bank. The draw deck is then formed by adding a certain number of Egg cards to the rest of the Dragon cards. The number of Egg cards is determined by the number of players. The deck is then shuffled together and placed face down near the middle of the play area. The top 16 cards of the deck are then used to create the forest, which is a 4 x 4 grid in the middle of the play area. The wooden tokens are separated into sets with each set containing a token of each color. These tokens are then placed beside the forest cards where that there are no tokens of the exact same color directly across from each other. The first player is randomly chosen and play now begins. The game is played through a series of turns. To begin the game, the starting player will roll all of the dice. The dice are then placed on the corresponding colored tokens in front of them, with the white die being placed beside them. On a player’s turn, they will then be able to take a number of actions that must be taken in a particular order. Each action is only able to be taken once per turn. There are 4 different actions that may be taken; catch dragons, refill the forest, reroll the dice and place one dragon seeker. The first action is to catch dragons. This action is optional and costs 1 coin. To perfom this action, the player must have a Dragon Seeker on a Dragon card in the Forest. When it’s taken, all players will take all of their Dragon Seekers and the Dragon cards beneath them, adding the Dragons to their collection. The next action is to refill the forest. This is also an optional action that costs 1 coin. To take this action, there must be an empty space in the Forest. When it’s taken, the player turns over cards from the draw deck and places them face up in the empty spaces of the Forest. If the draw deck runs out when this action is taken, the game immediately ends. Another optional action is for the player to reroll the dice. This action costs 1 coin and when taken allows the player to reroll all of the dice, placing them on the wooden tokens in front of themself. It should be noted that if there are no dice in play due to the previous player using all of them, or there are only useless dice that will not allow the player to place a Dragon Seeker, then the player is allowed a free reroll of the dice. The final action is to place a Dragon Seeker. This is the only action that is required for players to take. However, it doesn’t cost anything for them to take it. This action requires the player to place one of their Dragon Seekers on a Dragon card in the Forest. To do this, they must first choose a colored die that was placed on one of their colored tokens. They will then count up a number of cards in that color’s column that is equal to the number shown on the die. The Dragon Seeker is then placed on that particular Dragon card. The die used is then taken off the colored token and set aside, making it unavailable to be used again until the reroll dice action is taken. It should be noted that the white die is used to modify the value of one of the colored dice by either adding or subtracting it’s value from that of the chosen colored die. Once it’s used, it’s also set aside just like the colored die is. If a player places their Dragon Seeker on a Dragon that already contains another player’s Dragon Seeker, that player must take their Dragon Seeker back and they receive a coin from the player that removed them. It should also be noted that if a player is not able to place a Dragon Seeker on their turn, they must pay a penalty of 5 coins to the bank. Once a player has completed this final action, they will end their turn. They will then place any unused dice onto the next player’s colored tokens. Any dice that were set aside from being used are not passed. During the game players will be collecting Dragon cards. Every time they have two Dragon cards of the same breed and opposite genders, they will form a breeding pair. When this happens, the player receives gold coins equal to the highest value of the two cards. The mated cards are then stacked together and placed face down in front of the player. It should be noted that sometimes players will discover Dragon Eggs. These do not have to be paired and will automatically reward the player with 2 coins. The card is then placed face down with the mated pairs. The game continues with players taking turns until the draw deck runs out of cards during a refill the forest action. When this happens, the game ends immediately. The rest of the turn is not finished. Players will then take any Dragon cards marked with their Dragon Seekers without paying to take the action. Mating pairs are then made following the rules above. Final scoring then occurs. Players add up their gold coins, subtracting any dragons that were unbred. They will also gain a 5 gold coin bonus if they were able to breed at least 1 pair of all 5 dragon breeds. It should be noted that a pair of egg cards can be counted as a wild for this diversity bonus. Players compare their totals and the one with the most gold coins is the winner. There are some really cute components in this game. First off there are the Dragon Seekers. These are brightly colored meeples made of wood. There are 4 different colored sets of 3. These are good and sturdy, yet I somehow wish that these had been made a little more thematic. Like maybe shaped a little different or had some nice little stickers of the Dragon Seekers to be applied. There are also sets of large wooden discs in 4 colors that match with the 4 colored wooden dice. These are also brightly colored and sturdy. They’re large enough to be able to set a die on top of. As I just mentioned, there are 4 colored wooden dice and a there’s also a white wooden die. The colored dice have pips while the white one has numbers on it. It looks as if the pips and the numbers were painted on the dice. Hopefully there won’t be a problem with fading later after repeated plays. The game also comes with a punchboard full of coins in 1s, 5s and 10s. These are good and thick cardboard. I like the design on these. However it appears that there is a slight misprint on the back as the designs don’t exactly line up like they should. Finally there are the cards. There are lots of Dragon cards, some egg cards and some player aid cards. These cards are completely square and have a nice finish and thickness to them. The artwork on these is really great. I love the cute and fun look of each dragon and egg. There are a few surprise designs that are pretty cool. The player reference cards are very helpful. Overall I really like the pieces of the game. I think that a few things could have been done better, but for the most part they’re really good. I think that kids will love the fun designs and colorful pieces of this one. Mine did. The rulebook for this game is quite nice. There are plenty of pictures and examples throughout the book. Every action is explained in good detail. There’s a great explanation of the Dragon cards that contains pictures of the 2 genders. I think the design is nice and the rules are easy to read and understand. I didn’t see anthing difficult at all. It doesn’t take a long time to read either, as the book is only like 7 pages of instructions. Overall I like how quickly that I was able to read the book and how easy it was to understand. I’m pleased with the look and design. This game is actually quite fun but simple. In some ways it has a bit of a worker placement feel to it, as you are trying to place your Dragon Seekers onto the right dragons to be able to make mating pairs with. I will say that there is a good bit of luck involved with this one though. As you’re rolling the dice, the only thing that keeps it from being a complete luck fest is the white die. Using that 1 die, you’re able to change one of the other dice either negatively or positively. For instance, if you roll a 4 on the purple die but you really wish that you’d rolled a 2 to be able to get that red female dragon you need to mate with your male red dragon. Oh look at that, you have a 2 on the white die. That means if you subtract that 2 from the 4 of the purple die you can now place a Dragon Seeker on that red female and collect her a bit later. Win! For us home schoolers, that is a great way to teach a little simple addition and subtraction without the kids realizing it. Win-Win! I really like the simplicity and fun that this game brings to the table. The kids love matching up the dragons. In some ways the game kind of reminds me of Grave Business, a game about making zombies by matching up parts in a 4 x 4 grid. The game play is very similar in that aspect. However I do like the theme and implementation a bit better in this one. Fans of Grave Business or simple worker placement games should really enjoy this one, especially if they like the cute and fun art style. Overall this is a game that I would definitely recommend, especially as a family game to play with the kids. It’s good fun for everyone. 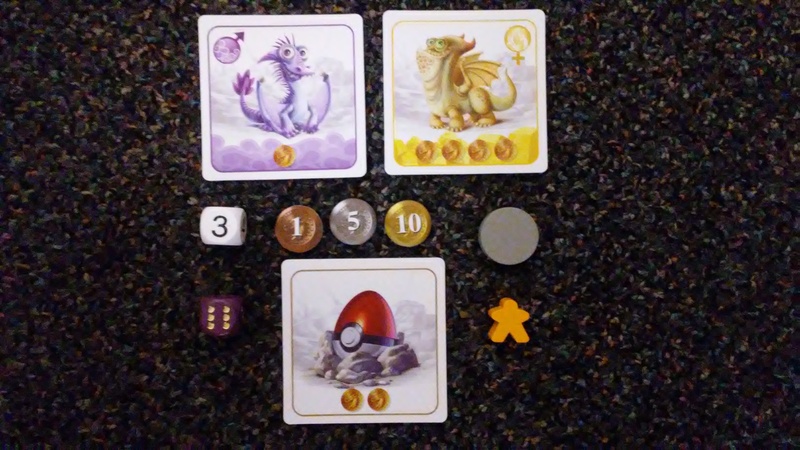 Dragon Pets is a great family game with cute and fun artwork. It’s quite simple and doesn’t take a long time to play either. Most game sessions last around 30 minutes. The artwork is really fun and the kids love it. I will say that I wish the Dragon Seeker meeples had been a little more thematic in either design or with stickers to place on them. I also worry a bit about the wear on the painted pips and numbers on the wooden dice. Apart from that, the game looks great and is one that the family really enjoy. I like the simplistic game play. It kind of reminds me of Grave Business and it’s 4 x 4 card style of game play. I think fans of that game should enjoy this one even more, especially if they like the dragon theme or are playing with kids. I think as a family game, it’s great. The kids love it and I do too. I would definitely recommend this one for families. Now get out there and bring me some dragons. This entry was posted in Reviews and tagged board, board games, card, card games, cecchetto, christian, Christian Giove, dragon, dragon pets, games, giove, japanime, japanime games, paolo, Paolo Cecchetto, pets. Bookmark the permalink.